The day on the Stour had gone well with David he caught a couple of good chub and a roach of about 1lb. Andy (you should have been here yesterday ) Cowley had a great day whilst I was on the Stour he had this beautiful barbel of exactly 11lbs. On 6lb line whilst fishing for chub. That was great angling and skill Andy in a very difficult swim with plenty of weed. The day saw me looking around at various locations for the elusive barbel. They were thin on the ground and spotting them was difficult as there was plenty of cloud and the breeze which rippled the river surface. Great in terms of the fish not seeing me however for me it was not the best conditions. I could make out huge shadow shapes in a couple of swims which were barbel. Then the smaller ones were chub. 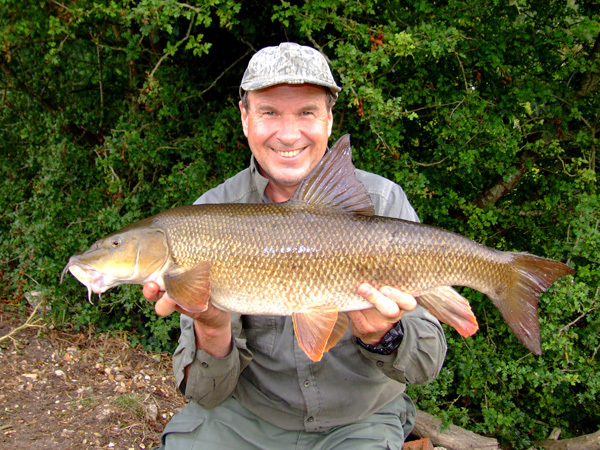 I looked for most of the morning and spotted an enormous barbel that was picking up the odd pellet that I threw in. 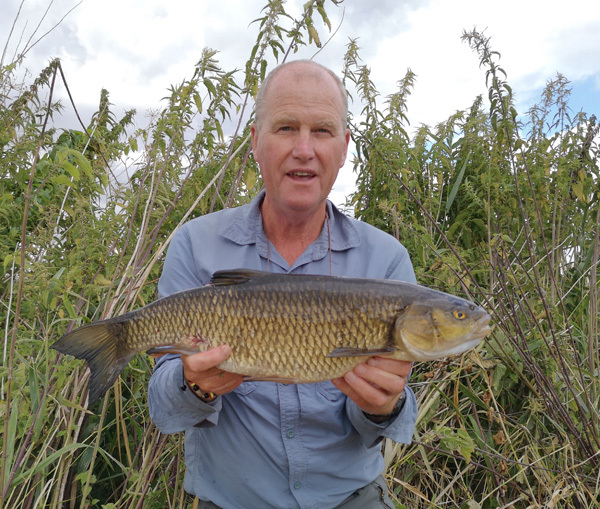 It’s probably the largest barbel I had seen with my own eyes in the river. There were a couple of others that came up to feed. Another double and a much smaller fish. Of course there was the chub that kept coming in and feeding. It’s not the easiest of swims to fish. An underarm cast saw the bait land in a tight gravel channel surrounded by weed. And that was it nothing showed up again. It’s often frustrating when this happens however with the river so low and clear you have to accept it, even with everything pinned down and back leaded. I moved off to feed another swim where I had seen 6 fish two days ago. I put in a few pellets and waited an hour and nothing, correct nothing showed up. Walking downstream I noticed 2 doubles through the rippled surface by a small amount of streamer weed. They would come out have a little feed then disappear. It was fishing blind however I still stood a chance. First fish was a small chub of about 4lbs which didn’t help the cause somewhat. Then 30 minutes later another chub hung itself on the rod and this one was just around the 5lb mark. That was it for me I wandered off to look at other spots. A few barbel came out to feed in one area however when I cast out nothing showed including the hordes of chub. Another angler was on the opposite bank to the swim where I wanted to fish. I moved again to one which I call the best chub swim on the river. It was but had altered over the years and it’s difficult to present baits in there during the winter. Summer is different however it’s the winter when it comes into it’s own. Well I only had about an hour in the swim. One gudgeon, chub and dace later it was time to pack up and make a move for home. So not the best of days but still very satisfactory for the soul. This entry was posted on Wednesday, August 15th, 2018 at 3:16 pm	and is filed under Uncategorized. You can follow any responses to this entry through the RSS 2.0 feed. Both comments and pings are currently closed.